We have already received the tightly integration of Twitter into iOS, with the launch of last year latest iOS 5, but still there are lot of iOS users who don’t like to use the Twitter and have a great community over the Facebook, and want something for their Facebook buddies. However, for those users now we have a new tweak in Cydia Store that will bring the Facebook integration into the iOS exactly similar to the Twitter integration into iOS. 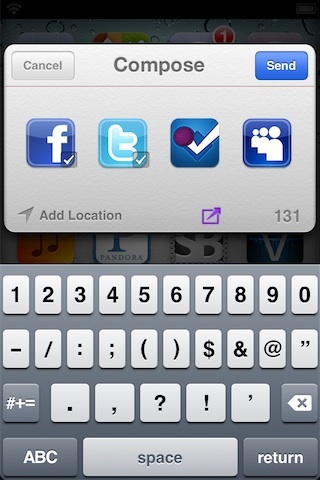 Fusion – is a new jailbreak tweak, recently launched in Cydia Store with an ability to integrate Facebook, Foursquare, and even the dead MySpace into the default iOS composition pane, and allows you to use the pane exactly as you use for Twitter to post new tweets. Now you would be able to post new updates to Facebook, and share info on Foursquare, using the same composition pane on your iPhone / iPad. The tweak doesn’t end here; it also allows you to use the same social integration even with the Siri, you can even use Siri to compose and post messages on Facebook, Twitter, Foursquare with this new tweak. One of the great things about Fusion is you don’t need to learn any new thing to use it on your device; you can reach your social circles using the old and default methods which you use for Twitter on iOS devices. You won’t have to set any new thing to make it work on your device. We know a lot of users are desperately waiting for Apple to integrate the Facebook into iOS, but it seems that Apple is not going to give a chance to Facebook, after their little mess with the Ping and Facebook integration. However, the Fusion has just filled the space, and introduced what users want on their devices, now users won’t have to wait any more to see Apple and Facebook decisions for the iOS integration. Fusion is available to download, and it is available to purchase from Cydia’s BigBoss repo. Fusion comes with a little price tag of $2, but we guess it is enough for this kind of deep integration of social networks on iOS.